He was also a Stinchcombe, Bellringer and joined the 7th Battalion Gloucestershire Regiment. The following is from the history of the Gloucestershire Regiment who left Gallipoli on 8th and 9th January 1916 so Private Hawkins who served right through Gallopoli died during the evacuation. He had not long returned to duty after a bout of enteric. 7th (Service) Battalion, The Gloucestershire Regiment was raised at Bristol in August 1914 as part of Kitchener’s First New Army and joined 39th Brigade 13th (Western) Division which assembled on Salisbury Plain. They moved to Tidworth and and spent the winter in billets in Basingstoke. They moved to Blackdown, Aldershot in February 1915 for final training and sailed from Avonmouth on the 19th of June 1915 landing at Alexandria then moving to Mudros, by the 4th of July to prepare for a landing at Gallipoli. The infantry landed on Cape Helles between the 6th and 16th of July to relieve 29th Division. They returned to Mudros at the end of the month, and the entire Division landed at ANZAC Cove between the 3rd and 5th of August. They were in action in The Battle of Sari Bair, The Battle of Russell’s Top and The Battle of Hill 60, at ANZAC. Soon afterwards they transferred from ANZAC to Suvla Bay. They were evacuated from Suvla on the 19th and 20th of December 1915, and after a weeks rest they moved to the Helles bridgehead. They were in action during The last Turkish attacks at Helles on the 7th of January 1916 and were evacuated from Helles on the 8th and 9th. William was the first-born child of Francis William (27) and Mary Ann Whelan. He was born on the 17th February 1885 at Stinchcombe. His father was a coachman/servant. In the 1901 census, at the age of 16, he was working as a market gardener. On the 11th October (1910?) he was accepted as a Police Constable with the Gloucestershire Constabulary and given the warrant number 3839. He commenced duties in Cheltenham, then soon afterwards transferred to ‘F’ division, where he was stationed at Tutshill police station, near Chepstow. Twice during 1911, he was seconded to assist in the policing of the Cardiff seaman’s strike, but returned back to Tutshill. 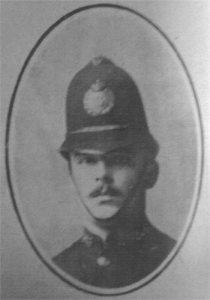 He served a total of 7 years with the Constabulary, but on the 1st February 1912 for unknown reasons, he resigned. Before enlisting he was working on the railway at Gloucester. William never married and was the eldest child and had three brothers who also served in the Army during WW1. He is remembered on Panels 101 – 104, The Helles Memorial in Turkey. Remembering Pte William Francis Hawkins, 11294, 7th Btn Gloucestershire Regiment, a member of the Gloucester and Bristol Diocesan Association and ringer at this church, who died at Gallipoli on 8th January 1916, aged 30.